Snowsport ski and snowboard waxes & base treatments have been cult-like topics in the outdoor communities for decades, with products and personalities around the World espousing wonderful properties and performance claims each season. Skiers and snowboarders gravitate to some favorite brands and techniques, and to tell you the truth, most popular waxes work pretty darn well if the right formula is applied with the proper techniques for the specific snow conditions, while producing terrible results if chosen or applied poorly. We’ve all seen solid waxes, paste waxes, hot-waxes, cold-waxes, rub-ons, iron-ons, powders, ointments, hot-boxing, infra-red treatments, paraffins, fluorocarbons, hydrocarbon-blends, non-fluorocarbons, carbon-infused waxes, plant-based treatments, ivory-soap treatments, DPS’s new “one-application-for-life” Phantom treatment and everything short of shaman-like incantations uttered into the East winds (OK, OK….yes, the elite nordic waxing gurus at the World Cup and Olympics do utter incantations into the East winds to enhance their waxing voodoo, but that’s another topic for another day when we want to discuss waxing religions…). We’ve been using a variety of Green Ice Wax products for the last 4 seasons in nearly every kind of snow you might encounter, and have been really happy with the performance and workablity of the waxes. There are a bunch of perfectly great waxes on the market ranging from high-flourocarbonracer-oriented formulas to eco-minded, biodegradable “green” waxes, and every combination in between from different kinds of companies, so we tried Green Ice’s eco-friendly waxes since we…well…live in Vermont…and buying local or regional “green” products is what we do around here. This review is not a scientific test with thermometers, friction testing devices and microscopes. It’s our seat-of-the-pants description of our day to day experience with Green Ice waxes over 4 seasons. Green Ice donates some waxes each season at no cost to support our testing program. We liked Green Ice Wax so much after the first season of testing, we asked if the company would donate a supply of waxes each season for our ExoticSkis test skis. There is nothing more irksome than a ski with bad wax, so if Green Ice didn’t work well, we wouldn’t use it. Period. The waxes work really well for us, so Green Ice sponsors our wax supply in exchange for our promotional badge at the right side of our web pages. If we didn’t think the wax was worth mentioning, we wouldn’t mention it, much less promote it on our website, even if we got it for free. If we find something that works well, we think people should know about it, and if we get the product at a discount or sponsored at no cost. “Green Ice Wax is race-inspired, environmentally-friendly, and cost-effective. The waxes utilize technology borrowed from the cosmetic industry for water repellency and lubricity, does not contain hazardous fluorocarbons found in most of today’s ski waxes. Green Ice Wax technology makes it safe for anyone to apply and handle. No more need for a bulky mask during application. Green Ice Hydrocarbon, 1000, and 2000 are available in a variety of hardnesses for use in all snow conditions. For more detailed information, check out our Products page. Green Ice Ultimate, Green Ice FE, DemoDon’s Glide Wax and N8 products are comprised entirely of renewable resources, minimizing the Carbon Dioxide (CO2) foot print, which helps to protect our environment. HG Skis and Rocky Mountain Underground leverage Green Ice Wax to help make their manufacturing processes more sustainable. Both Realskier.com and Exoticskis.com give GI Wax the thumbs up Exotic skis test all their skis with GI biodegradable wax. As far as waxing at ExoticSkis.com goes, we always keep the test skis waxed so they run their best to eliminate bad wax effects upon a ski’s personality and handling traits. We also hate dry bases and think ski bases should be protected from contamination whenever possible. Our typical wax routine is a drip-wax application (hold bar of wax against a warm iron and drip onto the ski), followed by a number of passes of the iron up and down the base to fully saturate and spread the wax as much as possible, trying to evenly-heat the base from tip to tail. We follow that up with a cool-down period, then hand-scrape to a thin residual layer. After scraping, we cork the surface, then follow up with a nylon brush in a tip-to-tail direction. We tend to want a thicker, more long-lasting wax layer than a one-run, super-thin race-wax treatment so we can keep the wax available on the ski all day long. We are not “white-glove-race-tech” waxers when it comes to the test skis. We always ask people who come back from testing skis how they liked the wax job, so we get some feedback. We typically wax test skis before returning them to the manufacturer, so the next people on that pair get a nice ride and have a protective coating on the base of the skis during transit and storage. We tested in filthy, dirty, pollen & grit infested Spring snow, fresh powder, slush, packed powder, boilerplate, corn snow, super-dry sub-zero snow, old snow, new snow, groomed snow, cruddy snow, windpack, coral reef…you name it. We don’t freely admit to any grassy weedy patch skiing, although it may have happened without our knowledge at some unspecified times. Maybe. We love the idea of small, regional and local ski companies, so when we heard of the environmentally-friendly, non-fluorocarbon Green Ice Wax from Richard Beneduci on the East coast of the U.S., we wanted to see if a small-batch wax could deliver the performance we were accustomed to from big-name wax companies such as Swix, Dominator, Toko, Holmenkol and others. 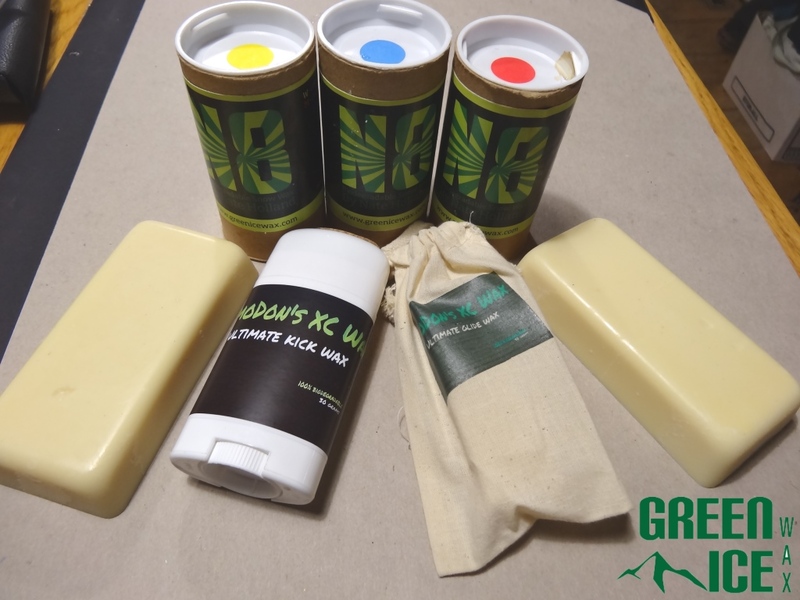 Rich was kind enough to supply us with some samples of his various waxes for our test skis for a season, and we were impressed enough to adopt Green Ice Wax as the standard wax for all our test skis over the last 4 years or so. (Apparently, the folks over at RealSkiers.com like his waxes too…so don’t just take our word for it.) Rich’s waxes proved the small wax companies can indeed produce eco-friendly, high-performance products every bit as good as big-name brands without the fluorocarbons or high corporate overhead. There are a number of small wax companies now, so there are choices among the micro-brands, and the innovation is exciting to see. Green Ice Wax is one of these companies. The no-fluorocarbon GI1000 and GI2000 paraffin (hydrocarbon-based) series of high-performance, race-like waxes work really well across their temperature ranges, are durable and easy to work with. The super eco-friendly, no-fluorocarbon GI Ultimate and N8 series of bio-degradable, non-paraffin waxes give up a little bit of the race-like wax performance for an truly guilt-free wax experience knowing you’re essentially using plant-based waxes instead of petroleum-based materials. The Ultimate and N8 non-cold formulas can become a little bit gummy in the scraping process if you generate some friction heat while gross-scraping, but this doesn’t happen with the cool or cold formulations. We found the Ultimate universal wax was ideal as a spring wax and storage wax, working well in warmer conditions. We preferred the cool or cold formulations of Green Ice for mid-winter conditions. The crew here at ExoticSkis.com ranges from ex and current international competitors, national competitors, multi-decade ski testers, kid coaches, dirtbag ski bums, shop employees, shop managers, civilian intermediates, experts, teenagers…kids…you name it. Most of us just want a wax to make the skis slippery so we can have fun on the mountain in various snow conditions, and we want to protect the running surface of our skis from the elements and nasty contaminations which could hamper our sliding fun-factor. We also are keenly aware our choice of recreation has impacts on the environment we love, and our choice of waxes has an impact on our health and the health of our families living with our waxing habits in our workshops. The adverse health and environmental effects of high-performance, high-flouro waxes are well documented, and these waxes and treatments may be banned from usage in the near future if some lobbying efforts in Europe and the U.S. succeed. Many grade schools in the U.S. are now forbidding the use of high-fluorocarbon waxes and treatments out of concern for the health effects and long-term residual contamination potentials being revealed in medical literature. That being said, the crew at ExoticSkis.com feels there are viable alternatives to fluorocarbon waxes, and if we can find products with lower impact, we and the environment are better off. If you need to wear a respirator to wax your skis…you’re not choosing a healthy wax option for anyone or anything around you. The Ultimate and N8 (Nate Holland) series of Green Ice waxes are fully biodegradable, non-paraffin based. The Ultimate wax is made from “bio-based raw materials, no solvents, chemicals or plasticizers”. They both “borrow technology from the cosmetic industry for water repellency and lubricity”. The Nate Holland (N8) series offers cold (<18 deg. F), medium (18-28 deg. F) and warm (28-35 deg. F) temperature formulations. The Ultimate wax is a universal, one-temperature wax. Of interesting note is the warning on the website “May Contain Soy”. The Ultimate wax is a relatively soft, (nearly gummy if you rub a piece between your fingers for a while to soften it), sweet-smelling wax we found ideal for summer storage, base-cleaning and warm-snow or spring conditions or general (“universal”) wax when we don’t know the snow conditions. We found the relatively soft Ultimate wax is not suited for cold, frigid conditions (single digits or below), being too sticky to slide on the really cold, frigid surfaces (We switch to the cold formula N8 for those cold temps). The Ultimate is a wax we kept using most often throughout the season because it seems to run well when you cork it smooth and brush it, and it spreads easily with a mild iron, getting nicely even coverage across the base material. It smells sweet and makes waxing almost like an aromatherapy session. When you scrape the Ultimate wax, it nearly peels off in soft layers, softer than, let’s say a Swix red wax. Knowing the Ultimate wax is about as eco-friendly as you can get, you might get a bit smug with your eco-ego….but that’s the price you pay. While the Ultimate is not as slick and speedy as the GI 1000 and 2000 race waxes, it works perfect for all but the coldest days, and keeps the skis running nicely. At $34 usd for 150 grams, you can wax all season long with a super-eco wax and not go broke. That’s a winner in our book. Racer-types and wax-gurus will want to up their game to the GI series for the best slick feeling on snow if they’re willing to trade off and use a paraffin (petroleum-based) wax. The N8 series appears to be based on the Ultimate wax (it feels and smells nearly identical), but apparently includes additives and reformulated ratios to produce several temperature ranges. We found the N8 series tends to be a little less gummy when scraping, and runs a bit faster. The cooler range N8 series tends to last longer as well, being harder when cooled after waxing. This series is a little more expensive, but offers the medium and cool temp ranges, which you want in your waxing quiver. When scraping the N8 cool series, it produces a nearly brittle, powder-like residue, leaving a hard wax surface behind to polish and brush. Sharpen your plastic scraper for best results. We found having the Ultimate wax for general usage, and some N8 cool formula covered nearly all our waxing needs for a season (unless we wanted to get racy and use the GI 1000 or 2000 formulas for maximum speed). Neither the Ultimate or N8 waxes left our bases whitened after running on cold-hard surfaces like some waxes can. For top speed performance across most snow conditions, a paraffin (petroleum) -based wax seems to be something nearly all wax formulators start with as a base, introducing specialty additives and top-coat treatments as finishing touches. Green Ice has two levels of paraffin wax: GI 1000 and Gi 2000 at increasing price points. GI 1000 is the all-purpose, general usage wax available in a full range of temperatures of cold, cool and warm. It contains no fluorocarbons. This one feels most like a “traditional” civilian wax like Swix, Toko or Holmenkol in the way it goes on and the way it skis. We found it works really well, and lasts a bit longer than the Ultimate or N8 series of waxes, but doesn’t have the full “eco-factor” we enjoyed with them. It’s really a nice wax, but doesn’t have a super-standout feature other than being small-batch, non-fluorocarbon and very affordable from a small workshop. GI 2000 is Green Ice’s race wax. This one is more expensive, but really runs fast across a wide range of snow temperatures and granularities. There is a significant improvement in sliding performance and durability with the GI 2000 wax over the GI 1000 series, and you pay 3 times as much for it. Green Ice Wax has a number of racers across the spectrum who podium with the GI 2000 waxes, and since there are plenty of wax choices out there, most racers stick with waxes they can win on. 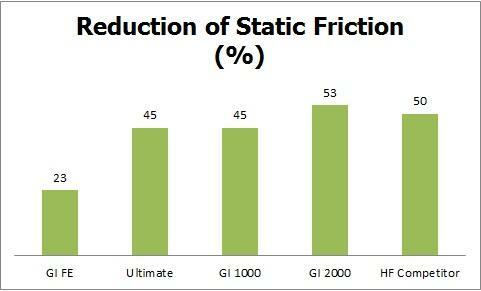 That says something about the GI 2000 waxes. The thing we noticed about the GI 2000 waxes was the more refined way they finished off with a cork or brush, leaving a low-friction surface that ran nice and fast for nearly an entire day, even with changing snow conditions. Rich tells us the GI 2000 series is the best-selling wax in his lineup, which is interesting since it’s the most expensive. At $45 for a 50 gram block, enthusiasts across the spectrum (besides us) must really like the product. We found the GI 2000 was the wax for “those special days” when we wanted the best glide we could find in the waxing box, or we wanted to impress people with how Green Ice Wax can run. When we tested skis like the exotic Carpani SL, Northland carvers or Parlor Warbirds, we chose the GI 2000 wax to get these high-performance, race-infused skis to really shine, and returned them with a nice coat of the GI 2000 to impress the next skiers who took them out for some runs. Every product has some drawbacks if you look hard enough. With Green Ice Wax, we found the Ultimate formula would not work in frigid temperature snows well at all. In one sub-zero testing day, we actually had to remove the Ultimate wax using base cleaner and reapply a cold-specific layer of GI 1000 we had with us. The Ultimate is too soft for the snow crystals at -5 to -10 degrees F air temperature. The skis were simply doggy and did not want to slide well. You can reproduce this behavior if you wax with any soft, warm weather wax on a subzero, frigid day. While the Ultimate wax is described as a “universal” wax, it really works well only above 10 degrees F (in our opinion), so we would recommend a revision to the Green Ice description for this product to reflect our experiences. The other issue we found was the Ultimate and N8 warm formulas (not the cool/cold formulas) could produce a slightly “gummy” effect when doing a first scrape of a ski. The friction of scraping can soften the rough wax layer enough to cause a gummy residue to pile up on the scraper instead of peeling off a nice shaving of rough wax you can brush away. Aggressive corking of a thick layer of Ultimate or N8 warm formulas can produce the same effect. We found using the scraper slowly reduced this behavior, and finally settled on scraping the gross wax layer off the ski while still warm, then finishing the scraping job with regular scraping motions after a cool-down period. The paraffin-based GI 1000 and 2000 series waxes had no such issues. We really liked the biodegradable composition of the Green Ice Ultimate and N8 waxes, and the no-fluorocarbon characteristics of the entire series. We hear the “no-flouro” or “low-flouro” wax products from nearly every other wax manufacturer are selling well, and with regulatory restrictions on fluorocarbon waxes coming from governments and schools around the World, it may be the future of wax chemistry going forward. The aroma of the Ultimate and N8 waxes is nearly sweet, and makes the shop smell nice…a far cry from the traditional paraffin-based wax smell we’ve all grown accustomed to. The waxes also spread nicely and controllably at fairly low temperatures with an iron. The performance and durability of the Green Ice waxes keeps us coming back for more. If the wax didn’t work well, we’d get rid of it since there is no reason to use waxes that don’t make you happy. There are plenty of choices out there, so ditching one brand of wax for another is a no-brainer if it doesn’t work well. We also like the idea of using a wax from a small company to use on skis from small companies…but that’s just a weird quirk we have here at ExoticSkis.com. We choose Green Ice Wax for our test skis so we get a really nice performing wax with eco-friendly formulations from a small company. Green Ice Wax is one of the small wax companies everyone should have on their radar. We’d be curious to have people compare other eco-friendly waxes with Green Ice Wax and let us know how they work for different conditions ranging from filthy Spring snow to fresh, cold smoke powder and everything in-between. We applaud the big wax companies like Swix, Toko, Hertel, Holmenkol and Dominator now offering “biodegradable” and “eco-friendly” wax product lines, we encourage skiers and riders to seek out low environmental-impact waxes from small companies like Green Ice.